For starters, you can read my two prior posts on this subject (here and here). The following information provides a few more key details in the management of my diabetes. Also, this is useful information for anyone, not just diabetics. True, diabetes is rapidly becoming an epidemic. There’s a reason for that: most people are working with very little (and often bad) information about what constitutes a truly healty diet. You may think you are completely safe, as I once did. How Did I Become Diabetic? Type 2 diabetes does not develop overnight. There is a process of accumlated resistance to insulin that develops over time. This process appears to be linked, in most people, to the accumulation of even relatively small amounts of excess fat on the body, notably around the middle of the body. That is not to say that all those who accumulate such fat will become diabetic or, for that matter, that thinner folks can’t. But, here’s the important part: for most of (eating the Standard American Diet) this fat accumulates because when you eat more ready-to-use carbohydrates than your body can use right away or store as glycogen, it must be converted to fat for future use. So, unless you’re very active, even small amounts of simple carbs are going to force your body to do things that it shouldn’t have to do….more on that later. For the record, my own weight gain was relatively slow, amounting to perhaps 2 or 3 pounds per year for at least 25 years. And, yes, that amounts to more than 75 pounds overall. Understand: This is equivalent to roughly 10,000 calories per year or 27 calories per day. That’s right. That’s equivalent to 2 extra slices of bread per day. That’s it, that’s all. That little bit of softness around your own belly is, in all likelihood, resulting from the same process…perhaps at different rates. In fact, the rate of accumulation does, generally speaking, change as you age. No big surprise here…it becomes more pronounced as you begin to tire those metabolic mechanisms over time. If you look around you, just about everyone you know is well above their ideal weight. (The latest CDC figures estimate 70% of adults are either obese or overweight.) See how many fingers you need to count the number of friends and aquaintences you have that are within 5 pounds of their high school weight. Not many I’m guessing. And, the older you are, the fewer fingers you’re really going to need. Now, in my case, I can be reasonably certain that there were, very probably, some basic metabolic issues early in my life, but, no matter, they did take root at some point. It may have been as early as I accumulated the first 10 lbs (over my 185 lb high school weight) or, perhaps, somewhat later. It’s really hard to know for sure. Note: Gary Taubes notes that the insulin driven fat storage mechanism is actually so strong and unyielding that it effectively robs you of energy needed to move your body. The obese – like a teenager going through a growth spurt – is simply tired because the body is allocating nutritional resources to needs dictated by your hormones. Insidiously, the obese, who already have a higher overall metabolic rate, need even more food in order to have enough energy to get through the day. Cutting calories, intentionally or otherwise, is only going to lead to exhaustion. Because you get some immediate boost from carbs, however, you eat even more just to stay alert and to get a little energy boost. And, because the body processes these carbs so quickly, you get even hungrier all the sooner. Because you’ve become habituated to re-fueling with easily digested carbs, your insulin response – while it still works, that is – will rapidly lower your blood sugar and you’ll need to start the process all over again. Over the last year (2010-2011), apparently, I personally crossed a rather critical threshold. Having begun to experience a variety of, shall we say, digestive issues, I thought it appropriate that I add more fiber into my diet and to, more generally, change my eating habits. Most of these changes involved having smaller, if more frequent, meals, not skipping breakfast, etc. Most of the added fiber, perhaps 3/4 overall, came from fresh fruits. Up to that point, my diet was already well structured on the the classic “food pyramid” with carbohydrates providing (easily) 60%, possibly more, of my total caloric intake. With the additional fruit, this ratio surely rose even higher. Then, too, most of the base carbs in the diet, were on the relatively “simple” end of the scale. While I was never much for sweets or soda, I was a “pastaholic” (now in recovery). As most diabetics already know, this was a classic “carb trap”. The real problem with carbohydrates, especially the simper carbs, is that they are very satisfying, but only for a short while, actually increasing the body’s hunger response once they’ve been digested. Taken without sufficient fiber and/or fat, they are dumped into the bloodstream very quickly, producing a sugar high of increased energy and mental acuity that disappears just as fast as it comes. Worse, your body becomes acclimated to higher and higher levels of glucose in the blood as less and less of it is “taken up” by the muscles and brain. At some point, you begin to feel “low” (hypoglycemic) even when you are “high” (hyperglycemic). Fatigue after eating (a relatively common malady) was, retrospectively for me, a sign that something had begun to impede the body’s ability to process glucose, which should have provided and energy boost after a meal. Of course, the body was now going to extremes, dumping insulin to combat the rising (and increasingly dangerous) levels of glucose in my blood and, of course, metabalising fat for basic functions, rather than the food I was eating, which was still mostly carbohydrates. It became increasingly clear that I was not getting better or more fit. Dehydration became a problem as the body began dumping sugar into my urine. But, what really rang my bell was the discovery that my blood pressure was spiking into new and dangerous territories – 160/110. What role, if any, did eating fruit play in the development of my diabetes? What’s that mean? Well, the bottom line is that, while fresh fruit is better for you than table sugar and/or high-fructose corn syrup, these sorts of simple sugars, still tend to increase the body’s tendency to convert glucose directly into fat stores, contributing to obesity and taxing the body’s insulin sensitivity over time. In this case, however, more of that occurs in the liver itself, contributing to a potentially deadly condition known as fatty liver disease. Take that you “fruitarians”. It seems rather obvious to me that any cure for what is, effectively, compromised insulin sensitivity needs to address that issue head on. First, you can’t process simple carbs so you have to reduce them. Second, you have no hope of being able to boost your insulin sensitivity until you lose the weight that has accumulated. Third, fortunately, losing the weight will be quite easy once you start to limit the carbs. This isn’t rocket science. Get at least 30 minutes of exercise every day….however light or strenuous I felt up to doing. Limit total caloric intake to approximately 1800 to 2000 kilocalories per day, shooting for weight loss at a rate of roughly 2 lbs per week. Eat as many carbs I could process and keep my daily average blood glucose under 110 or so. This demonstrates just how quickly the glucose regulation was accomplished. As you can see, roughly normal average blood sugar levels were established within one week or so….without medication. Yes, that was at least partly due to the restricted intake, especially of carbohydrates….but, it goes to show you just how quickly it can be done. For the record, my HbA1c score at the beginning was 10.0%, being roughly equivalent to a daily average of 240-250 mm/l . By 14 weeks it measured in at 4.9 (or, perhaps a daily average of 97 mm/l). 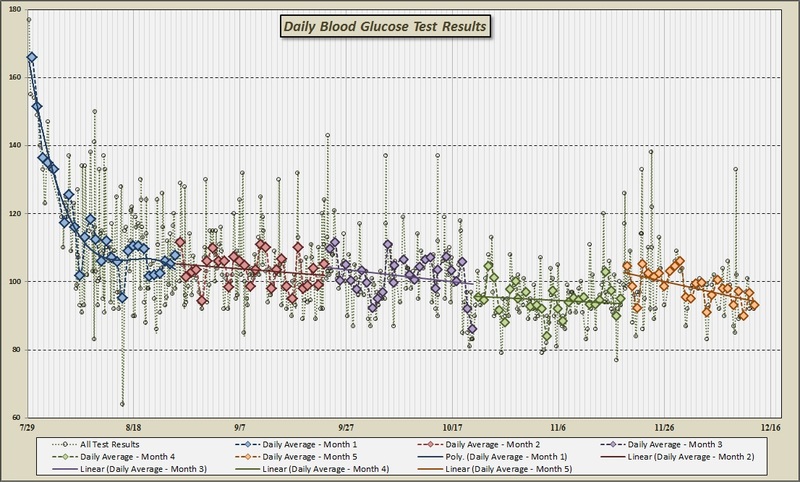 As the A1c (theoretically) measures your average daily glucose over a three month period, you could easily say that I had normalized my glucose within one or two weeks time and kept it there for the following 3 months. As noted before, my weight loss (and improvements to my cholesterol) were also quite good. Much better, in fact, to the results produced by most conventional diet and medical treatment programs. My “lowish carb diet” results compare rather favorably with those produced in this oft-cited study. At this juncture, I can’t say I’m a “full-on” low-carb advocate. I can only say that doing what is obvious common-sense is, often, good advice. In this case, it was clearly necessary to restrict my carbohydrate intake. Truthfully, I didn’t even know the differences between the various Atkins, Zone, Miami Beach, or Paleo diets out there. But, I discovered that I could easily achieve my goals with carbs limited to near 100 grams per day. But, while I’ve clearly demonstrated the benefits of reducing carbohydrates in my diet, we need not become overly overly dogmatic about the issue. For one thing, I’m now trying to add “good” carbs back into my diet, incrementally, as I now test and rebuild my insulin sensitivity. I’ll eat whatever I can eat that is healthy and satisfying. But, we’ll address this in more detail in the future – specifically looking at issues such as why we can’t seem to control our weight, what damage is being done in the process, and how treating the symptoms is almost always going to make things worse in the long run. The real point here is that: when you’re house is on fire, you have to put the fire out before you can assess the damage. Put another way, toasting marshmallows may not be your best option. I don’t disagree that, for some, taking medication may be necessary, but there is a growing body of evidence that these issues can be effectively and quickly resolved through diet and exercise alone, even for those with relatively serious cases. For me, however, taking medication would have – I believe – greatly compromised my treatment plan. Notably, I’d be constantly fearful of hypoglycemic “lows” due to caloric restriction and/or exercise. Furthermore, I’d never really know to what extent any of my efforts was producing positive results. I don’t see that as very helpful. I’ll add some more here over time, but for now….